With these opening words, I was hooked into the world of Kristin, Izzy, Clara, and Natalie and their lives in their small community. I’ll you tell from the beginning, I need more Izzy. Her words stayed with me for days. She needs her own story. Please tell me she has more to share with us. Now that I’ve shamelessly begged for a supporting character’s HEA, let’s talk about Kristin. 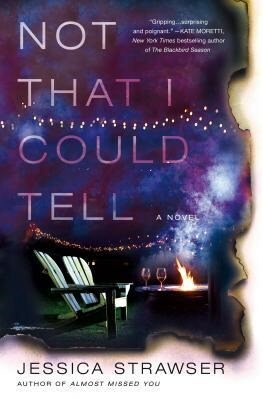 The book begins with the ladies enjoying a kid-free night around a backyard fire pit and freely flowing wine. Some of these friendships are new and developing and this night is a great start to growing those connections. The next day, Kristin is gone. Her twins are gone. And nobody has any information. In fact, none of the women remember much about the previous night. The rest of the story is closer look at Kristin’s husband, Paul and the other 3 women, their spouses/partners, and the police investigation. This is not a clinical methodical murder investigation story. It’s a darker side of women’s fiction. I loved every minute with this book. This is the second novel by Jessica Strawser and I must now find her first book. Reading Not That I Could Tell was a fantastic journey and I would love to explore more from this author.